GRAPHTEC CE6000 Plus SeriesVinyl Cutter / Cutting Plotter is amongst the easiest to use on the market whilst yielding high quality results every time. We are offering Graphtec Cutting Plotter to our client. Graphtec CE6000 Series Vinyl Cutter The new Graphtec CE6000 offers outstanding and professional performance at a reasonable cost and moves the cutting capabilities of the CE series nearer to those of Graphtec GB's flagship FC8000 series but without the need for a huge additional investment. The CE6000 series delivers a maximum cutting force of 300 grams and an improved maximum speed of 35.4 inches per second (in all directions). The built-in front control panel provides complete parameter control including eight preset cutting conditions, as well as advanced features like tangential control mode, downforce offset, pen up speed, blade wear monitoring and more. With a 25 pin RS-232C or the High-Speed USB 2.0 control interface, the CE6000 is compatible with legacy computer systems as well as the latest PCs available now and for several years to come. Graphtecs CE6000 feature faster cut time, precision cutting and a fast and accurate digital servo motor. Graphtec is known for quality and long-lasting machines and their new CE6000 cutters don't disappoint! These cutters also come equipped with the new Graphtec Studio Software, which makes designing and cutting an easy task. Graphtec Studio is an easy to use design software that has been developed exclusively for Graphtec to create original designs to be used for a variety of graphics applications such as signs, banners, print and cut decals, apparel decoration, and other two-dimensional projects. These cutters also feature a plug-in for Adobe Illustrator and Corel Draw. 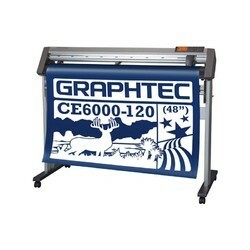 The CE6000 are Graphtec s professional class of cutter plotter series and updates the extremely successful CE5000 series with improved features. The CE6000 series is also cleaner, greener with an electronic design and manufacturing process that minimizes the environmental impact of the hardware equipment throughout its entire life cycle. Aiming to attain maximum client satisfaction as a reliable firm, we are engaged in offering Graphtec Plus Vinyl Cutting Plotter. 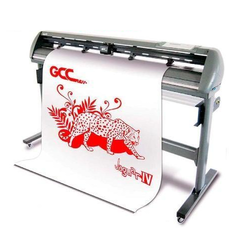 GCC Jaguar V LX Vinyl Cutter Plotter 24"
We are offering Cutting Plotter to our client.